KEA is a privately-held, international home products retailer that sells low-price products, including furniture, accessories, bathrooms and kitchens at retail stores around the world. It became famous for the fact that the customers have to assemble many of the products. IKEA was founded in 1943 by Ingvar Kamprad in Sweden and it is owned by a Dutch-registered foundation controlled by the Kamprad family. Did you know that the name IKEA is an acronym comprising the initials of the founder's name, Ingvar Kamprad, the farm where he grew up, Elmtaryd and his home village, which happens to be called Agunnaryd? KASSETT (meaning: cassette) for media storage. SK?RPT (meaning: sharp or clever) is a line of kitchen knives. A notable exception is the IVAR shelving system, which dates back to the early 1970s. This item is named after the item's designer. Due to the fact that IKEA is a world-wide company working in several countries with several different languages, sometimes the Nordic naming leads to problems where the word means something completely different to the product. While exotic-sounding names draw an attention, e.g., in anglophone countries, a number of them call for a snicker. Notable examples are "Jerker" desk, "Fartfull" workbench, or "Lessebo" sofa. The products are withdrawn, probably after someone pointed at blunders, but not before generating some news. Similar blunders happen with other countries as well, for example, a bed frame named GUTVIK was removed from sale in all German-speaking IKEA store locations... We won't translate that one!. Now I bet you didn't realise that there was method to that madness did you? In The Simpsons episode called Eight Misbehavin' the family visits a blue and yellow store called "SH?P" with meatballs, Lego forks and items named such things as P?pli pencil holder. In it they meet a 6-foot walking Allen wrench that explains how you put everything together yourself. The IKEA furniture line was satirized in the movie Fight Club, as a fictional "Furn?" store featuring generically designed products lacking soul or substance in the greater context of humanity. Although the catalogs shown in the film state "Furni" Edward Norton's character actually says it is Ikea. In Chuck Palahniuk's novel it is actually IKEA mentioned and not Furni. The interiors of the homes in John Woo's film 'The Killer' were furnished completely with IKEA items. Douglas Coupland makes reference to the low quality of Ikea products describing them as 'semidisposible Swedish furniture' in his novels Generation X: Tales from an Accelerated Culture and Microserfs. 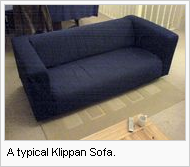 In Coupland's later book JPod, lead character Ethan Jarlewski's apartment is primarily furnished with IKEA furniture. Cherie Blair (the wife of the ex British prime minister Tony Blair) was once reported to have said in May 2006, "The cabinet is like an Ikea cabinet ? one dodgy screw and it falls apart." In the pre-E3 Nintendo Press Conference Reggie Fils-Aime justified the Nintendo Wii name to be weird at first, just like what happened with Google or IKEA; this underscores how IKEA has become a household name. Take a look over at http://www.iamcal.com/games/ikea/ - You get given a name of an Ikea product, and you have to guess what type of product it is, hours of fun!